The VA Staff Award goes to a Department of Veterans Affairs staff member in the community who has exhibited a strong commitment to the service of homeless veterans. 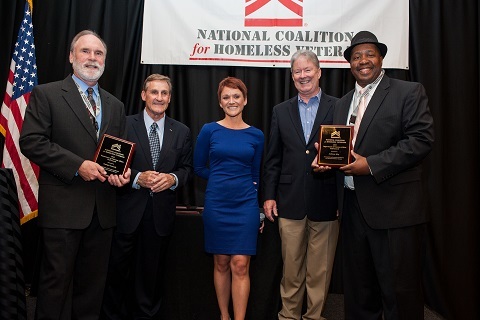 This year, NCHV presented VA Staff Awards to George Kennedy and Anthony Irby. George Kennedy embodies the model of successful reentry services through his role as a Healthcare for Re-entry Veterans Specialist at VA Palo Alto. He has shown a commitment to improving the Healthcare for Re-entry Veterans model, provided mentorship to colleagues, and supported national evaluations to improve effectiveness and efficiency. Anthony Irby serves as the sole Homeless Veterans Outreach Coordinator and Justice Involved Veterans Coordinator at the Phoenix VA Medical Center. He has used his vast knowledge of VA benefits programs and his network of specialists across the state to empower veterans in need. Since 2006, he has brought more than 1500 homeless or at-risk veteran claims to the Phoenix VA regional office. His passion and work ethic are unparalleled in dedicated service to the veterans in his community.